Mouats Farm Shop offers you farm fresh produce such as cherries, apples and other fruits in season, plus fresh free range eggs, home made jams and more. 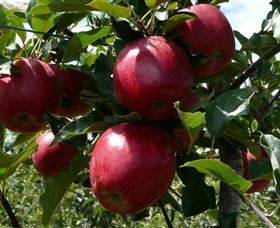 Located four kilometres north of Batlow, Mouat's Farm 'Wyola' was originally planted as an orchard in the early 1920s. Apples comprise 90 per cent of their plantings, and there are 1,200 cherry trees, and a small amount of stone fruit and berries. In season produce is available at the farm shop. Current produce and pricing can be found on the website. Sugarpine Walk is one of Batlow's best kept secrets. 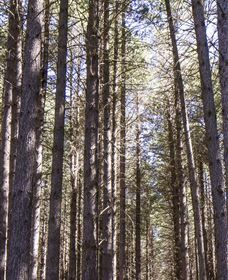 Take the short stroll amongst a dense stand of enormous sugar pines planted in 1928. This species is the largest and tallest of all pines. The walk is located on the edge of Kopsens Road, around half a kilometre from the Batlow-Tumbarumba Road at Laurel Hill. 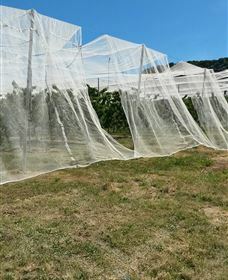 Wilgro Orchards is conveniently situated on the main Tumut to Batlow Road just four kilometres north of Batlow. There is a wide range of both new and old varieties of apples that have been tree ripened to taste the way an apple should taste. Cherries are also grown at the orchard and have built a fine reputation for large, sweet, tree ripened fruit. Our roadside stall sells our fruit direct from the orchard to you during the picking season. At Wilgro Orchards the fruit is grown as naturally as possible with very low chemical and fertiliser usage. At times when there is only limited passing trade or the orchard is particularly busy we have to depend on the "honesty system" and the stall is not always manned all day. We can usually have someone in attendance if we are notified in advance. 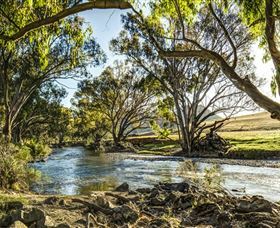 The Snowy Valleys Way, running from Gundagai, New South Wales to Beechworth Victoria, is a touring route encompassing over 300 kilometres of breathtaking scenery and landscapes, and a whole swag of things to see and do 'along the way'. The route starts in the hills of Gundagai, home of the famous 'Dog on the Tuckerbox', and winds its way south through Tumut, Batlow, and Tumbarumba, crossing the Murray River at Towong, and continuing south through Corryong, and Yackandandah, ending in Beechworth, Victoria. A picturesque slice of Australia, the Snowy Valleys Way offers its travellers spectacular outdoor activities, colourful festivals, towns to explore, and a laid-back rural charm that distinguishes it from other popular tourist drives. Travellers can choose their own adventure - bushwalks or four-wheel driving, horse riding or mountain bikes. Paddle, fish or water-ski the numerous lakes, rivers and streams or simply relax by their foreshores. 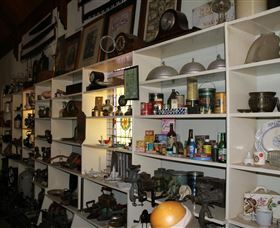 Explore eclectic collections significant to the history of the Batlow region at the Batlow Historical Society. Experience the hardships of early pioneers and the drive of visionary Herbert Velvin Smith (OBE) who made Batlow 'Famous for Apples!'. Discover fascinating tales of pioneers, and read about the development of the Batlow Fruit Co-operative and its early coolstores, the Mountain Maid Cannery, the Australian Women's Land Army and Batlow's early Hydro Electric Power Supply. Collection highlights include a restored 1932 Dennis Fire Engine.